Want to take real control of your Mac? 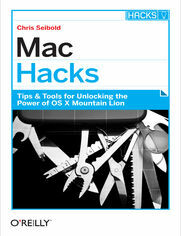 The hacks in this book help you dig below the surface to tweak system preferences, mount drives and devices, and generally do things with your system that Apple doesn’t expect you to do. With a little effort, you can make your Mac and its applications perform exactly the way you want them to. There are more than 50 hacks in this book that show you how to fine-tune the interface, work with multimedia, set up your network, boost security, and perform a few tricks with Unix. What Makes a Good Backup? Two Home folders or a Home folder to go? Step 1: Why Are You Here? Do You Have the Bandwidth? Using Terminal Commands: A Better Way?